After veering seriously off piste with last weeks selection of Alpine Inspired, Genepi cocktails, I thought I'd bring it back closer to home and what can be more British than gin? Well, quite a lot apparently, as gin actually originated in Europe in the middle ages, as a kind of moonshine liquor, flavoured with juniper berries, distilled by monks, no doubt looking for a little entertainment to relieve the tedium of endless chanting and scratchy robes. In fact, gin didn't appear in England until the early 17th century, but it's popularity soon took hold when, due to the heavy duty imposed on imported spirits, gin shops sprang up all over London. Cheap gin was considered to be the root cause of many the social problems facing the poor and was famously depicted by Hogarth in his series' of engravings, including, Gin Lane (seen below). These days, gin has become a drink for the discerning tippler, with a vast array of wonderful distillations to choose from. The wonderful Hendricks gin has a distinctive flavour, due to the botanicals used in it's distillation and the infusion of rose and cucumber which may well make it a wonderful facial toner too, although, perhaps best not to try that out.. Other notable gins include Tanqueray and of course, Gordons; a bottle of which is always in my drinks arsenal, as it is the favoured beverage of the in laws. So, for the purposes of this week's blog, I am using, the eternally popular, Gordons, although should anyone (ahem, take note Mr TG) wish to gift me a bottle of Hendricks, I would love to try out some other fabulous gin cocktails. For a mind boggling selection of gins, including Hendricks (pictured), Tanqueray and the amusingly named range from Van Wees. visit Amathus Drinks , either online or at one of their London stores. The first cocktail I tested, was the Earl Grey Martini, a drink that sounded like my perfect cocktail, combining the flavours of Earl Grey tea, lemon and gin - what's not to love? And sure enough, it was a triumph - a delicious and refreshing marriage of flavours that left me wishing I had infused more gin so I could 'test' another one! The infusing bit does require a little forethought, but is in no way complicated. Ahead of mixing, pour the gin into a glass and sprinkle over the loose tea. Allow to infuse for 2 hours and then strain, discarding the tea leaves. Next up was the Aviation cocktail. My decision to include this was mostly led by last week's purchase of Creme de Violette and Luxardo's Maraschino liqueur from Just Miniatures, two unusual ingredients, that happily, both feature in this classic cocktail. The Aviation first appeared in print in a book by New York barman, Hugo Ensslin in 1916. The drink called for London Dry Gin, lemon juice, maraschino liqueur and Creme de Violette. The drink's name was in reference to the emerging era of flight, a truly monumental advance for mankind that was initiated only a few years previously by the Wright brothers. 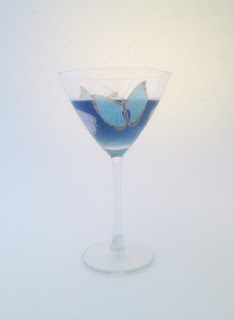 The addition of Creme de Violette gives a sky blue tinge to the drink and it's association with flight, gave it a modernity that it made it a popular choice. Today it is a classic cocktail that is enjoyed by cocktail aficionados, in part, due to the inclusion of two, rather more unusual ingredients. 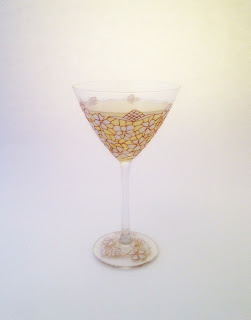 This week's final cocktail is a Gin and Elderflower Martini and if you follow this blog, you'll know I am a huge fan of the Chase Elderflower Liqueur, made in Briitain at the Chase Vodka Distillery. Not only is it delicious, but it comes in a divine bottle. 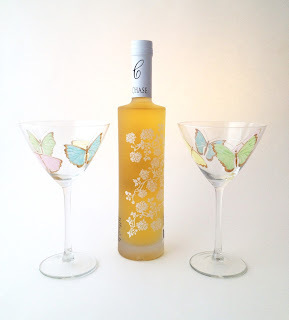 For other delicious cocktail recipes using Chase Elderflower liqueur, do take a look through some older posts. With a bit of sunshine on the horizon, I enjoyed this week's cocktails immensely. The flavours were fresh and zingy, just right for sipping in the garden (or anywhere else for that matter). The Aviation Cocktail is one I will definitely ask for when out as I think it deserves to be enjoyed in a glamorous, old fashioned cocktail bar and the Gin and Elderflower Martini was always going to resonate well with me, but this week's clear winner, is the Earl Grey Martini. A heavenly marriage of flavours that really works perfectly with gin.